Although reactive glial cells and the upregulation of cytokines was found in the brains and cerebrospinal fluid of patients with PD, the role of neuroinflammation in the pathogenesis of PD is still undetermined . Neuroinflammation in PD has long been considered a downstream response to neuronal damage. However, alteration of glial physiological functions are emerging as causally linked to brain diseases. In the healthy brain, astrocytes maintain ion homeostasis of the microenvironment, provide structural and metabolic support, regulate synaptic transmission, water transport and blood flow . Additionally, microglia continuously extend and retract their process to interact with neurons and other types of glial cells, including astrocytes. Microglial phagocytosis (alongside other mechanisms, such as synaptic stripping and “trogocytosis”) plays an important role in the engulfment of synaptic elements [10, 11, 12, 13, 14, 15, 16]. Recent studies also revealed that astrocytes contribute to phagocytic clearance in a similar manner during normal physiological conditions  and there is abundant evidence that microglia and astrocytes communicate with each other [18, 19, 20, 21, 22]. It was further proposed that astrocytes can ingest aggregated proteins from the extracellular environment, suggesting that astrocytes keep, in coordination with microglia, the brain clean [23, 24, 25, 26]. Since the elimination of unwanted and potentially harmful matter is crucial for central nervous system (CNS) function, dysregulation of glial phagocytosis and degradation might have a key role in PD pathogenesis. PD-related genes are expressed in astrocytes and microglia at levels comparable to neurons, while proteins encoded by several of these genes are implicated in degradative processes [27, 28, 29, 30]. Here, we will discuss the role of glial phagocytic clearance in pathological conditions and the possible implication of PD-linked mutations in this important process. Finally, we will discuss the therapeutic potential of enhancing or restoring glial cell phagocytic and degradative capacity as future treatment for PD. Phagocytosis is defined as the cellular uptake of particles (> 0.5 μm) within a plasma membrane envelope and partly overlaps with other cellular engulfing mechanisms such receptor-mediated endocytosis and macropinocytosis . Phagocytes comprising monocytes, macrophages, dendritic cells, Langerhans cells, osteoclasts and microglia [32, 33], are responsible for the clearance of infectious agents, dead cells and tissue debris and are involved in the immune response. Astrocytes are also considered phagocytes and are able to ingest cellular debris and other material such as synaptic elements [34, 35]. During phagocytosis, self and non-self target particles are recognized by specific receptors on the plasma membrane and the target-receptor recognition depends on specific engulfment signals (Fig. 1, Targets; Receptor-Target recognition). Apoptotic cells secrete molecules called ‘find me’ signals to attract phagocytes toward them (e.g. lysophosphatidylcoline, LPC; sphingosine-1-phosphate, S1P; CX3C motif chemokine ligand 1, CX3CL1; nucleotides). For instance, secreted CX3CL1 binds to CX3C motif chemokine receptor 1 (CX3CR1) on microglia resulting in their migration . Dying cells expose ‘eat me’ signals to be engulfed by macrophages, of which the best-characterized are the externalized phosphatidylserine (PS) on the cell surface. Exposed PS are recognized directly by PS receptors or indirectly by bridging molecules named opsonins (e.g. MFG-E8, Gas6, C3 and C1q). Fc receptor γ (FcRγ), the complement receptor 3 (CR3) and MEGF10, which are classified as opsonic receptors, are expressed in glial cells [37, 38]. FcRs bind to the constant (Fc portion) of immunoglobulin IgG or IgA antibodies whereas CRs bind to C3 deposited on the particle following complement activation. In microglia, pathogen-associated molecular patterns (PAMPs) are recognized by Toll-like receptors (TLRs) as well as by scavenger receptors (SRs), which are both non-opsonic receptors. Of note, TLRs are also expressed in astrocytes and TLR signaling can activate astrocytes to mediate neuroinflammation [39, 40, 41, 42]. Upon recognition by the appropriated receptor, additional receptors are recruited eliciting complex signalling cascades that involve cytoskeletal rearrangement of actin filaments (F-actin) (see Fig. 1, Internalization). Actin polymerization is the force driving membrane extension and phagosome formation. Cdc42 and Rac were identified as players downstream of FcγR, while RhoA is implicated in phagocytosis mediated by CR3 . One set of well characterized Cdc42/Rac effectors is the WASP family, WASP and WAVE, which are actin nucleation complexes that activate the Arp2/3 nucleation hotspot leading to the remodelling of actin network. In macrophages, uptake of exogenous particles and their degradation share features with autophagy, a process that incorporates endogenous organelles and misfolded proteins, and converges onto the lysosomal pathway (reviewed in [44, 45]) (see Fig. 1, Maturation). Specifically, maturating phagosomes acquire microtubule-associated protein 1A/1B-light chain 3 (LC3) and the recruitment of LC3 is mediated by the ubiquitin-like conjugation system proteins, Atg5 and Atg7 [46, 47, 48]. During LC3-associated phagocytosis (LAP), the phagosome surface decorated with phosphatidylinositol-3-phosphate (PI3P) binds to the Atg8/LC3 conjugation machinery, including Atg5, 12, and 16 L1, and NADPH oxidase 2 (NOX2)-dependent reactive oxygen species (ROS) production is required for LAP . Atg8/LC3 conjugation to phagosomes regulates their fusion with lysosomes (see Fig. 1, Lysosomal fusion and degradation). Notably, no study has yet assessed whether LAP occurs in microglia and astrocytes, together with the consequences of LAP deficiency or dysfunction in the CNS. Nonetheless, given that glial cells are phagocytic, as notably shown in vivo, and that the proteins discussed above are expressed in both astrocytes and microglia, then it is reasonable to infer that these cells are capable of LAP. Once internalized, the phagosome can fuse selectively with early endosomes and acquire the small GTPases Rab5. The transition from an early phagosome to a late phagosome is marked by the conversion from Rab5 to Rab7. Rab7 activity is essential for the movement of phagosomes to the cell centre and, therefore, for further phagosome maturation . In addition, the phagosome acquires lysosomal-associated protein 1 and 2 (LAMP1 and LAMP2), which are required for phagolysosomal fusion. During the maturation phase, other vesicles, from endoplasmic reticulum (ER) and trans-Golgi Network Golgi (TGN) complex, can be recruited to promote membrane extension . Certain phagosomal cargo proteins are recycled back to the plasma membrane or the TGN, mediated by different Rab proteins (Rab4, Rab11, and Rab10) and the retromer complex, respectively. 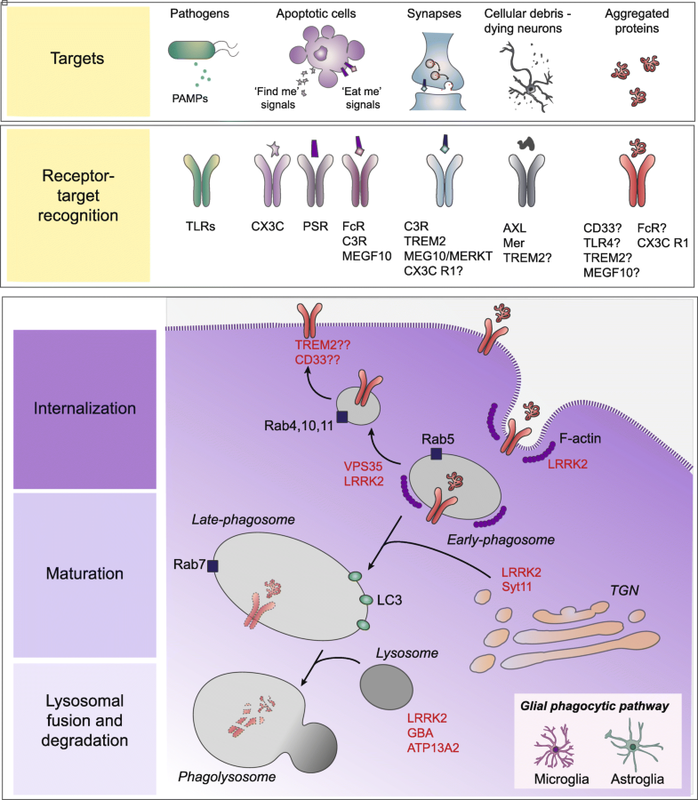 Overall, these observations demonstrate that the phagocytic pathway is highly dynamic, involves several protein components, and requires extensive membrane remodelling and recycling events that intersect with other cellular processes such as autophagy. During development, microglia are specifically involved in synaptic pruning , notably by engulfing and eliminating viable C3/C1q-positive synaptic structures via C3R . Microglia are also responsible for the elimination of apoptotic neurons generated in the context of adult neurogenesis in a process mediated by two TAM-receptor kinases, AXL and MER [54, 55]. However, microglia do not have a monopoly on synaptic pruning or CNS cleaning as astrocytes also play crucial roles in these processes (see next section). Recent data also indicate that microglial Triggering receptor expressed on myeloid cells 2 (TREM2) controls the process of synaptic pruning during postnatal development . TREM2 is a cell surface receptor of the immunoglobulin superfamily that is expressed is several cell types including microglia. When activated, TREM2 signals promote survival, proliferation, secretion of cytokines, and, importantly, phagocytosis . Therefore, the role of microglia in phagocytosis of synapses, when still viable, and neurons, when dead or dying, suggests that aberrations in these normal functions can contribute to synaptic loss and neurodegeneration. A clear link between impaired microglial phagocytosis and neurodegenerative diseases emerges from human genetic studies, including genome-wide association studies (GWAS). Indeed, variants in TREM2 are well-known for increasing the risk for Alzheimer’s disease (AD), reviewed in . Supporting the notion that deficient microglial phagocytosis might trigger neuronal death, several other genes with a role in amyloid β (Aβ) clearance were shown to confer susceptibility to AD (e.g. CD33, CLU and CR1) [58, 59]. Interestingly, TREM2 and CD33 variants have been associated with PD [60, 61, 62] and the recycling of microglial TREM2 at the plasma membrane was suggested to be regulated by the vacuolar protein sorting 35 (VPS35) , which is associated with autosomal dominant PD . However, the genetic data linking TREM2 with PD have not been replicated  and the involvement of TREM2 in PD still requires investigation. Analysis of histological samples from human PD brains revealed the presence of antigen presentation markers and a generally increased pro-inflammatory status [66, 67, 68] suggesting that microglial reactivity might compromise their homeostatic support to neurons, further influencing the pathogenesis of PD. Near the remaining nigral DA neurons, microglia also displayed morphologies characteristic of phagocytic cells, similar to those seen in aging . However, the presence of reactive microglia alone does not define the helpful or harmful role that their phagocytosis plays in PD neuropathology. Microglia show reactive phenotypes in animals injected with 6-hydroxydopamine (6-OHDA) or 1-methyl 4-phenyl 1,2,3,6-tetrahydro-pyridine (MPTP), two toxins widely used to produce lesions of DA neurons, and in neuron-glial co-cultures upon treatment with the pesticide rotenone [70, 71, 72, 73]. Microglia-linked neuroinflammation was associated with an increased expression of microglial synaptic pruning receptor, CR3, in rotenone-exposed rats  and the presence of complement activation markers in human patients . Of note, the knockout of C3, the component of complement system that induces phagocytosis through its interaction with C3R, rescues DA neurodegeneration in mice upon injection of the bacterial component lipopolysaccharide (LPS) . Overall, these results suggest that DA loss might depend on pro-inflammatory microglia, exerted through an aberrant activation of the complement-phagosome pathway. Astrocytic phagocytic processes appear to be altered during prolonged stress, aging and diseases. Upon sleep deprivation in mice, the MER receptor is upregulated and astrocytic phagocytosis of presynaptic components is enhanced, suggesting a role in the recycling of heavily used synapses . The involvement of MER in phagocytizing neuronal materials both in astrocytes and microglia might suggest overlapping functions between the two types of cells. In pathological conditions, reactive astrogliosis is characterized by a profound change in astrocyte phenotype in response to injury or disease . An intimate crosstalk exists between microglia and astrocytes. 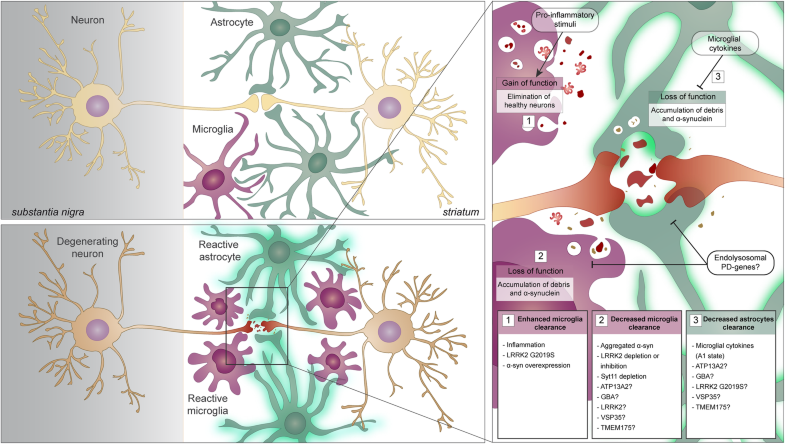 By releasing signaling molecules, both microglia and astrocytes establish a reciprocal communication during neuroinflammation (reviewed in ). In this regard, it has been proposed that neuroinflammation associated with ischemia can induce two different types of reactive astrocytes named A1 and A2, respectively [19, 108]. A2 are protective and, possibly, promote CNS recovery and repair during ischemia . For example, Morizawa et al. showed that astrocytes enhance phagocytosis, upregulate ABCA1, a protein known to be involved in cellular phagocytosis in the periphery, and its pathway molecules, MEG10 and GULP1, and contribute to the remodelling of damaged tissues after transient ischemic injury in vivo . In contrast, A1 astrocytes are neurotoxic and lose many normal astrocytic functions including the ability to support synapse formation and function and instead tend to phagocytize neuronal elements. It has been demonstrated that activated microglia induce A2 to A1 phenotypic conversion of astrocytes by the release of Il-1, TNF and C1q . Of note, the neurotoxic A1 astrocyte population is specifically observed in human neurodegenerative diseases including AD and PD, and during normal aging, suggesting that impaired astrocytic phagocytic clearance may contribute to increasing neuronal debris and abnormal protein accumulation, thus triggering neuroinflammation and neurodegeneration processes [18, 19]. Indeed, phagocytic activity of astrocytes appears to be important as a mechanism recruited for clearing damaged cells [35, 109]. In vitro, the release of cellular materials from laser-irradiated astrocytes or neurons induces a phagocytic response in nearby astrocytes . In rats, synaptic debris produced by the degeneration of the striatal DA terminals upon 6-OHDA injection in lateral ventricles were found within specific structures named spheroids that were transferred to astrocytes . Astrocytes can phagocytize large amounts of α-syn fibrils in vitro [25, 26]. α-syn is endogenously expressed at low levels in astrocytes [110, 111], but it can spread from neurons to glial cells and from one astrocyte to another astrocyte through the extracellular space, possibly inside of extracellular vesicles or via direct cell-to-cell transfer [23, 110, 112]. Astrocytes are able to degrade fibrillar α-syn as well as human α-syn purified from LBs both in vitro and in ex vivo brain slices, suggesting an active role for these cells in the clearance of α-syn deposits . However, the majority of fibrillar α-syn ingested by cultured astrocytes is stored intracellularly rather than degraded. The accumulation of aggregated α-syn in astrocytes also disrupts their lysosomes, impacts mitochondria homeostasis and may induce cell-to-cell transfer of α-syn via tunneling nanotubes [23, 25, 26]. Similar findings were reported for Aβ fibrils . Consistent with these results, there is evidence that cortical and striatal astrocytes from PD patients brains contain extensive α-syn deposits [7, 8, 113, 114, 115]. 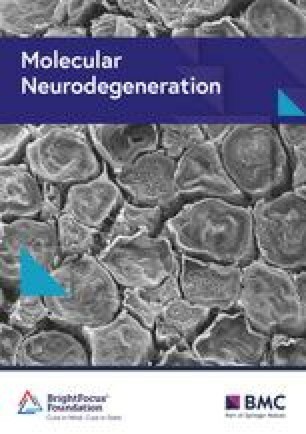 It is hypothesized that misfolded α-syn can spread from affected to unaffected regions of the CNS, leading to neurodegeneration and the progression of PD pathology (reviewed in ). Therefore, ineffective degradation of neuron-derived α-syn by astrocytes might contribute to PD pathogenesis and to intervene with the kinetics of astrocytic phagocytic capacity might be useful to slow down α-syn toxicity and stop its transmission. Two PD-associated proteins are specifically located at the lysosome and are essential for lysosomal functionality. ATPase type 13A2 (ATP13A2) is a protein involved in lysosomal cation homeostasis that is linked to autosomal recessive familial PD [119, 120]. ATP13A2 accumulates within LBs and ATP13A2 levels are decreased in DA nigral neurons from patients with sporadic PD  suggesting that ATP13A2 loss-of-function might contribute also to sporadic PD. ATP13A2 is a transmembrane protein localized both in lysosomes and late endosomes and dysfunction of ATP13A2 diminishes lysosomal degradation and autophagic flux [122, 123, 124], exosome externalization , and induces an accumulation of fragmented mitochondria [124, 126, 127]. Taken together, these findings point to a role of ATP13A2 in controlling the endolysosomal and autophagic pathways. Loss of ATP13A2 leads to lysosomal dysfunction and subsequent α-syn accumulation in cell cultures  while ATP13A2-null mice exhibit motor deficits, widespread gliosis, and lysosomal abnormalities . PD-linked mutations in ATP13A2 lead to several lysosomal alterations in patient-derived fibroblasts, including impaired lysosomal acidification, decreased proteolytic processing of lysosomal enzymes, reduced degradation of lysosomal substrates, and diminished lysosomal-mediated clearance of autophagosomes . Similar to other proteins involved in PD, ATP13A2 is expressed by microglia  and astrocytes  and deficiency of ATP13A2 induces astrocyte-related intense inflammation which exacerbates DA neuron damage in co-cultures . However, the precise role of ATP13A2 in the lysosomal pathway of glial cells and the impact of ATP13A2 loss-of-function in glial degradative capacity is as yet unexplored. As mentioned above, mutations in LRRK2 are a common cause of familial and sporadic PD [138, 139, 140]. LRRK2 plays a major role in vesicular membranes, as well as autophagy and lysosome biology , and its function is mediated by the phosphorylation of a subset of Rab GTPases (e.g. Rab8A and Rab10) [142, 143]. LRRK2 has been implicated in the regulation of lysosomal morphology and function in several models, including astrocytes [144, 145, 146, 147, 148]. Lysosomal abnormalities in different tissues have been observed upon the inhibition of LRRK2 kinase activity and in many LRRK2 knockout models [145, 146, 147, 148, 149]. iPSC-derived DA neurons from G2019S mutation carriers show an increase in autophagic vacuoles and an accumulation of aggregated α-syn . In addition, vesicles with multiple membranes resembling autophagosomes or autophagic vacuoles within regions enriched in axons and/or synapses have been reported in transgenic mice overexpressing the G2019S LRRK2 mutation . G2019S knock-in mutation in LRRK2 induces significant changes in lysosomal morphology and acidification, and decreased basal autophagic flux in mouse brain neurons. These changes are associated with an accumulation of detergent-insoluble α-syn and increased neuronal release of α-syn . Similar to ATP13A2 and GBA, LRRK2 is highly expressed in mouse and human astrocytes and plays a key role in the lysosomal function of these cells [27, 144, 153]. In mouse primary astrocytes, LRRK2 co-localizes with the lysosomal markers, LAMP1 and LAMP2, and LRRK2 deficiency significantly enhances lysosomal number . Interestingly, pathogenic mutations in LRRK2 in astrocytes produce enlarged lysosomes with a decreased degradative capacity and this effect is dependent on the kinase activity . Thus, LRRK2-dependent lysosomal dysfunction in astrocytes might exacerbate the neurodegeneration process because of their inability to clear up unhealthy neurons and the released α-syn. In neurons, LRRK2 is also recruited to the TGN and promotes the clearance of Golgi-derived vesicles by interacting with and phosphorylating Rab7L1 (Rab29) [154, 155, 156]. Along this line, LRRK2 was shown to regulate late endocytic membrane trafficking in a Rab7-dependent manner while mutated LRRK2 delays the recycling of the epidermal growth factor receptor (EGFR) . In addition, several papers point to a functional interaction between LRRK2 and VPS35, a core component of the retromer cargo recognition complex that plays a critical role in cargo retrieving pathway from the endosome to the TGN, involved in genetic PD [158, 159, 160]. PD-associated defects in LRRK2 or LRRK2 deficiency disrupt retromer cargo mannose 6-phosphate receptor (M6PR) trafficking and impairs secretory autophagy and Golgi-derived vesicle secretion [154, 161]. Expression of wild-type VPS35, but not a familial PD-associated mutant form (D620N), rescued these defects in D. melanogaster models . Noteworthy, VPS35 D620N knock-in mutation strikingly elevates LRRK2-mediated phosphorylation of Rab8A, Rab10, and Rab12 in mouse indicating that the two proteins function in a converging pathway and that mutant VPS35 exacerbates LRRK2 toxicity . Taking together, these observations might suggest possible implications of mutated LRRK2 and VPS35 in phagosome formation and/or phagocytic receptors internalization and recycling. A recent characterization of the biological function of Transmembrane protein 175 (TMEM175), encoded by a gene located under one of the most significant PD GWAS peak , Biorxiv: https://doi.org/10.1101/388165, suggests a role in the pathogenesis of PD. Specifically, TMEM175 is a lysosomal K+ channel that stabilizes lysosomal pH and regulates lysosome catalytic activity [162, 163, 164]. In neuronal systems, TMEM175 deficiency decreases GBA activity and the lysosomal-mediated clearance of autophagosomes with a consequent impairment in the clearance of exogenous fibrillar α-syn . Of note, TMEM175 mRNA was detected in brain glial cells with a particularly elevated expression in mouse and human astrocytes . However, TMEM175 function is poorly understood and no data is available regarding the effect of its ablation in glial cells. Since lysosomal degradation serves as a key final step to resolve protein aggregation upon glial phagocytosis, it is likely that TMEM175 dysfunction negatively impacts on this pathway.